Social media has been referred to as ‘everything from a godsend to a complete waste of time,’ ever since its birth, about a decade ago. However, what has become increasingly apparent in recent times is how useful social media can be, in the case of disaster-relief efforts – vis-à-vis in relaying messages to members of the public on the status quo. Even in Sri Lanka, this proved true earlier this year, when torrential rains inundated parts of the island. It has been reported that many residents of disaster-hit areas began to use social media platforms such as Facebook and Twitter, with the intention of sharing updates related to the disaster. Given that climate change patterns point to a greater frequency of weather-related disasters, as well as the gradual shift to social media versus traditional channels, it would be pertinent to explore the potential for using social media tools in times of emergency. 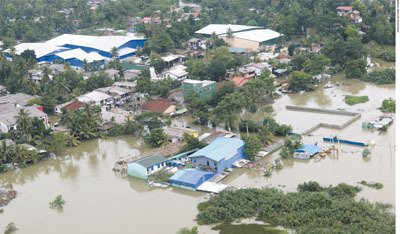 THE OFFICIAL RESPONSE At the time of the major floods and landslides that occurred in Sri Lanka this year, neither the Disaster Management Centre – the island’s main state agency tasked with managing disasters – nor the Meteorological Department had an active Facebook page or a Twitter account. Meanwhile, private aid agencies have climbed aboard the bandwagon, turning to social media platforms such as Twitter and Facebook to disseminate disaster-related information. A case in point is the Sri Lanka Red Cross (SLRC). According to a report by the Thomson Reuters Foundation, SLRC was the first to alert the country on the scale of devastation at the landslide site, in the town of Aranayaka, in May – this, reportedly, was while government officials hesitated to confirm the number of casualties, well after disaster had struck. Moreover, the Facebook Safety Check feature also enabled people to inform their kith and kin about their whereabouts, and whether they were out of danger. RELIEF COORDINATION In the wake of Cyclone Roanu – which was responsible for the adverse weather conditions in Sri Lanka – volunteer groups and relief providers were aided by the aforementioned social media channels, in their bid to conduct rescue missions and coordinate donations. The hashtag #FloodSL proved vital in this endeavour, as it was cited when tweeting and posting about flood-related emergency requirements such as food, first-aid and transportation. A number of home-grown digital service providers also contributed to relief efforts, by enabling their mobile apps to function as gateways to providing those most affected with emergency supplies and services. GLOBAL EXPERIENCE Of course, Sri Lanka wasn’t the first to rely on social media, in response to a disaster situation. REGIONAL EXAMPLES Closer to home, the April 2015 Nepal earthquake tested the power of a social media response. While volunteers used crisis mapping to help plan emergency aid operations, and public volunteers from across the globe added details onto online maps, information was mapped by using data input from social media, satellite pictures and drones – of passable roads, collapsed houses and people in dire need of assistance. In a similar scenario to that experienced in Sri Lanka, social media and technology came to the rescue of Nepalese citizens when disaster struck, even while official bodies may have failed to do so. FUTURE CHALLENGES Despite its potential to act as a means of responding to a disaster, there is also the likelihood of social media being used to spread misinformation, which would only serve to compound a given situation. After all, it only takes a matter of seconds for a mere rumour to be communicated from one device to the next, creating an almost global ripple effect that would need to be dealt with swiftly, to avoid mass chaos. Having responsible personnel at hand to set the record straight is, therefore, an absolute necessity.